Turns out man’s best friend can be man’s best helper, too. Data has shown that assistance dogs can help those with various disabilities, including individuals who have severe hearing loss. According to the American Kennel Club, hearing assistance dogs are specifically trained to support individuals who have severe hearing loss, and they essentially serve as their human’s “ears” for them. We were thinking — since these dogs do so much good for those in the hearing loss community, why not consider helping raise one yourself? Learn more about how assistance dogs can help those with hearing loss in this blog post, and consider reaching out to a local organization in Calgary to see how you can help raise these tiny pups into becoming hard-working dogs that help those with hearing loss. At Audiology Innovations, our audiologist in Calgary and staff of other hearing loss professionals can help educate you on the types of hearing loss where an assistance dog may be beneficial. We also offer an array of audiology services, ranging from complete hearing evaluations to funding assistance. Contact us today for more information. 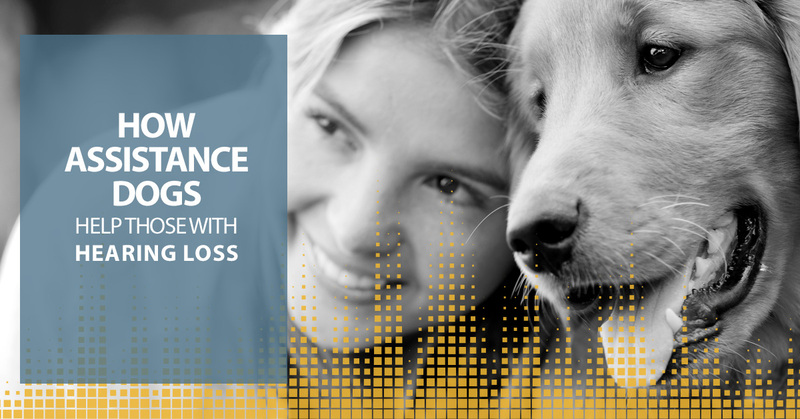 Continue reading below the learn more about how assistance dogs can help individuals in Calgary with hearing loss disabilities. Hearing dogs undergo several months of training so that when they’re paired with their owner, they know exactly how to navigate as their sound helper. They start with basic commands, such as “sit,” “stay” and “lay down,” and from there, they undergo extensive audio-response training. Knocking at the door/ringing of a doorbell. Traffic that is approaching at a crosswalk or while walking on the roads. When their owner is being spoken to. These are all sounds the hearing assistance dog will learn during their designated training period. Combined with a hearing aid, a hearing dog can be the perfect fit for several folks with severe hearing loss. They should be naturally attentive and alert to sound. They’re always ready to work. They’re friendly and love being around people, but should also be calm in larger crowds. Some primary breeds that make for great hearing dogs include Labrador Retrievers, Golden Retrievers, Cocker Spaniels, Poodles and other smaller and medium-sized mixes. A great way to find a hearing dog provider in Calgary is through Assistance Dogs International. If you want to learn more about hearing loss and how regularly seeing an audiologist in Calgary could benefit you or a loved one of yours, contact our team at Audiology Innovations today.You can reach our hearing professionals by calling (403) 252-4722 or by filling out our online form.